Cable TV Advertising - San Antonio Market Overview | Frink Inc.
San Antonio is the 31st largest television market in the country. San Antonio can be segmented geographically by placing ads in specific zones. There are five individual zones with approximately 65,000k-113,000 households in each zone. There is also an AT&T zone with approximately 123,000 households which skews slightly higher in income. 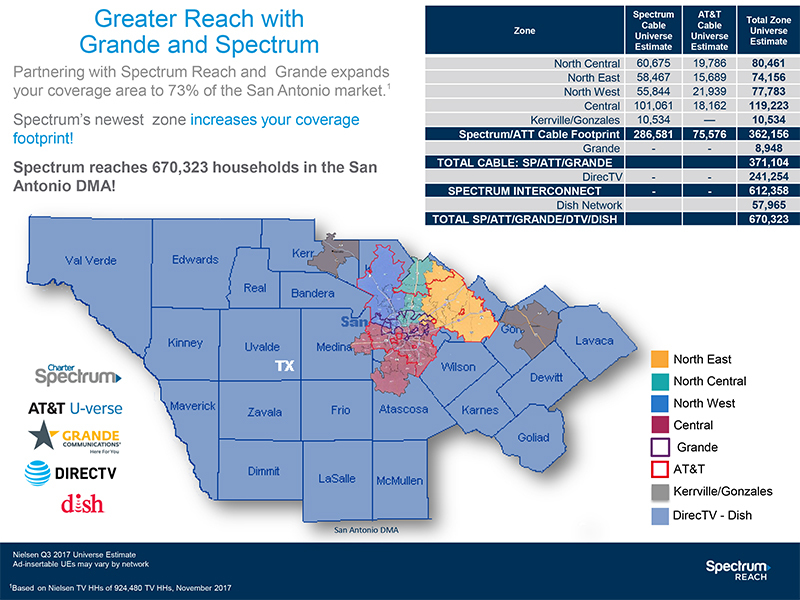 In addition to Time Warner you can place advertising with Grande Cable’s 14k households which are located in northwest San Antonio a higher than average income area. Local advertising can also be placed in Direct TV and Dish Network households. There are approximately 299,000 Direct and Dish Network TV households in the San Antonio 24 county DMA. Contact Bill Frink for more information.